Manuk Abeghian was one of the most important scholars of Armenian Studies in the first half of the twentieth century. At the conclusion of his remarkable career, he became one of the founding members of the Academy of Sciences of the Republic of Armenia in 1943. Abeghian was born on March 17, 1865 in the village of Astapat, in the historical Armenian province of Nakhichevan (today in territory of Azerbaijan). He was the son of an agriculturist. After his initial studies in the school of the monastery of Karmir Vank, in 1876 he entered the Kevorkian Seminary of Etchmiadzin and graduated in 1885. He taught for many years in schools of Shushi (Karabagh) and Tiflis. In 1893 he went to Europe and became an auditor at the German universities of Jena, Leipzig, and Berlin, as well as in the University of Paris. In 1898 he was awarded his doctorate at the University of Jena, where he defended a dissertation on the ancient Armenian beliefs. He returned to the Caucasus and was a teacher in his alma mater, the Kevorkian Seminary, until 1914. Then, he moved to Tiflis, where he taught at the Nersisian Lyceum until 1918. He moved to Armenia in 1921 and became a professor at Yerevan State University; he also was the dean of the Faculty of History and Literature from 1923-1925. In 1935 he earned a second doctorate, this time in Armenian philology. Abeghian was a foremost scholar in a variety of disciplines of Armenian Studies. He was a pioneering figure in the study of Armenian mythology. Besides recording several variants of the Armenian national epics David of Sassoun, he was the author of its first specialized study (1889). Together with his colleague Garo Melik-Ohanjanian, they both prepared a three-volume edition of all available variants of the epics (published between 1936 and 1951). Abeghian was also one of the authors of an integral version of the epics, which condensed all the variants into one single text (1939). He also published critical editions of Armenian popular songs and medieval poetry. 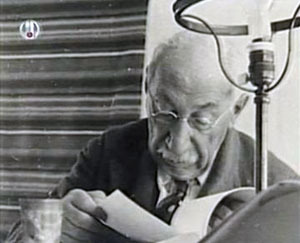 Among his major works was the two-volume History of Ancient Armenian Literature (1944-1945), which was left unfinished because of his death. Many of his studies were published in a collection of eight volumes between 1966 and 1985. Abeghian’s name was linked to the reform of Armenian orthography in 1922. After the sovietization of Armenia, the new regime started a policy aimed at the simplification of Armenian orthography, whose ultimate purpose was to eliminate the Armenian alphabet and replace it with Latin script. In 1921, Abeghian presented his personal views as a report in a conference organized by the Commissariat (Ministry) of Education. The same report was used a year later by the Commissariat, without consulting with Abeghian, to decree, on March 4, 1922, the reform of the orthography. For this reason, it is common to call the reformed orthography with the name of “Abeghian spelling.” The excesses in this reform motivated a new change in the Soviet Armenian orthography—used today in Armenia, the former Soviet Union, and among the “new diaspora” formed after the migration of the past 25 years—in 1940, which made it closer to classical orthography (used today by the Diaspora, both speakers of Western Armenian and of Eastern Armenian, in the case of Iran). Manuk Abeghian passed away in 1944. The Institute of Literature of the Armenian National of Academy carries his name.